Cutting edge granulovirus technology for the suppression of False Codling Moth (FCM – Thaumatotibia leucotreta) on various crops as specified on the label. Advanced baculovirus technology for the reduction of False Codling Moth A highly concentrated SC formulation of the Cryptophlebia leucotreta (Thaumatobia leucotreta) Granulovirus for the reduction of False Codling Moth. Registered for use on citrus, pomegranates and persimmons. Cryptex® – production, formulation and quality control: Andermatt Biocontrol is the leading producer of virus products and has more than 30 years’ experience in the production of these viruses for the commercial pest control. Granulovirus particles are covered by a natural occlusion capsule, which protects the virus from environmental factors. Inadequate procedures during production, improper timing of harvest, incorrect formulation and inappropriate co-formulants can lead to incomplete or damaged viruses which results in reduced stability, impacting the virus’ efficacy. Andermatt Biocontrol has optimized the production procedure to ensure that the virus particles are not damaged and maintain their virulence under varying application conditions. Product quality is very important for the Swiss company, and therefore their product efficacy is determined by evaluating the product on the relevant host insect itself. 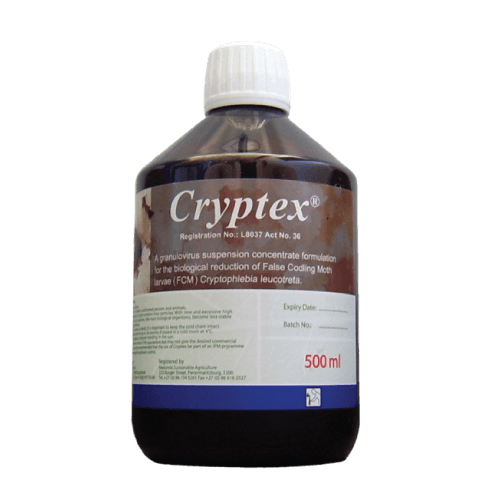 In the case of Cryptex®, each batch is tested via bioassay against FCM larvae. The quality control on FCM larvae ensures that only the most effective products are put on the market. Locally isolated granulovirus strain, manufactured in Switzerland by world renowned virus specialists, Andermatt Biocontrol. Highly effective FCM reduction and damage control when applied as recommended. Non-toxic, no MRL requirements and has no with-holding period. Proven and consistent efficacy against FCM on a variety of crops. An effective granulovirus product is one of the best tools available to reduce target pest populations. Cryptex® will not affect any beneficial organisms and is harmless to bees. Mode of action of virus products differ from chemical insecticides, making them ideal for use in IPM and resistance management programs. No feeding stimulant (molasses) needed. Lipophilic characteristics ensure excellent adhesion and rain fastness. Can be tank mixed with most agricultural products provided pH is correctly managed. Excellent shelf life; min. 24 months at 4 °C, unlimited if kept at –18 °C. Cryptex® is suitable for organic and conventional agriculture and can be applied during the harvesting period. Cryptex®, a Cryptophlebia leucotreta Granulovirus is produced by Andermatt Biocontrol. With more than 30 years’ experience in virus production Andermatt’s process ensures Cryptex® product quality and consistent performance. Cryptex® contains encapsulated virus particles, which are applied just after peaks in FCM flights. It has to be ingested by FCM larvae to be effective. Once ingested the alkaline conditions in the FCM midgut dissolves the protective capsule, activating the virus particle which infects and replicates itself in the cells lining the midgut and resulting in death. Buffering of the spray mix (pH 5 to 8) is extremely important as very alkaline or acidic conditions could dissolve the protective capsule in the spray tank and decrease the virus particle’s tolerance to environmental conditions, as well as overall efficacy. Figures right: The graph compares the average number of live FCM larvae in table grape berries after applications of Cryptex® (½X, X and 2X) compared to a biological standard as well as an untreated control. Applications were made after peaks in FCM moth flights and all treatments were evaluated 7 days after each treatment and at harvest. Cryptex® at all the rates provided significant reduction of the incidence of live FCM larvae in berries and Cryptex® at the X and 2X rates were the best treatments overall. 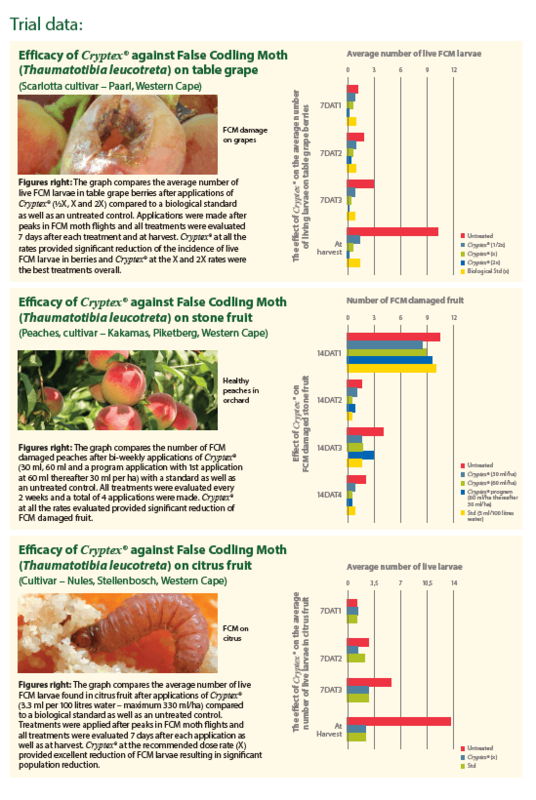 Efficacy of Cryptex® against False Codling Moth (Thaumatotibia leucotreta) on stone fruit (Peaches, cultivar – Kakamas, Piketberg, Western Cape) Figures right: The graph compares the number of FCM damaged peaches after bi-weekly applications of Cryptex® (30 ml, 60 ml and a program application with 1st application at 60 ml thereafter 30 ml per ha) with a standard as well as an untreated control. All treatments were evaluated every 2 weeks and a total of 4 applications were made. Cryptex® at all the rates evaluated provided significant reduction of FCM damaged fruit. Efficacy of Cryptex® against False Codling Moth (Thaumatotibia leucotreta) on citrus fruit(Cultivar – Nules, Stellenbosch, Western Cape) Figures right: The graph compares the average number of live FCM larvae found in citrus fruit after applications of Cryptex® (3.3 ml per 100 litres water – maximum 330 ml/ha) compared to a biological standard as well as an untreated control. Treatments were applied after peaks in FCM moth flights and all treatments were evaluated 7 days after each application as well as at harvest. Cryptex® at the recommended dose rate (X) provided excellent reduction of FCM larvae resulting in significant population reduction.